Several years ago I wrote a post about how frequently steam plumes are used as illustrations to articles on pollution. 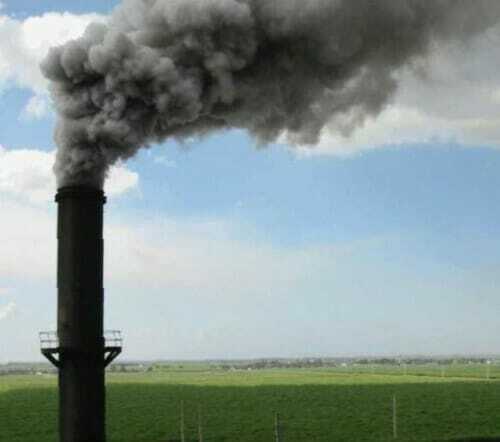 In the US, if you see a cloud coming out of a smokestack, adds are about 100:1 its steam, not smoke. Look how many of the results today in Google images for "air pollution" are actually plumes of water vapor. 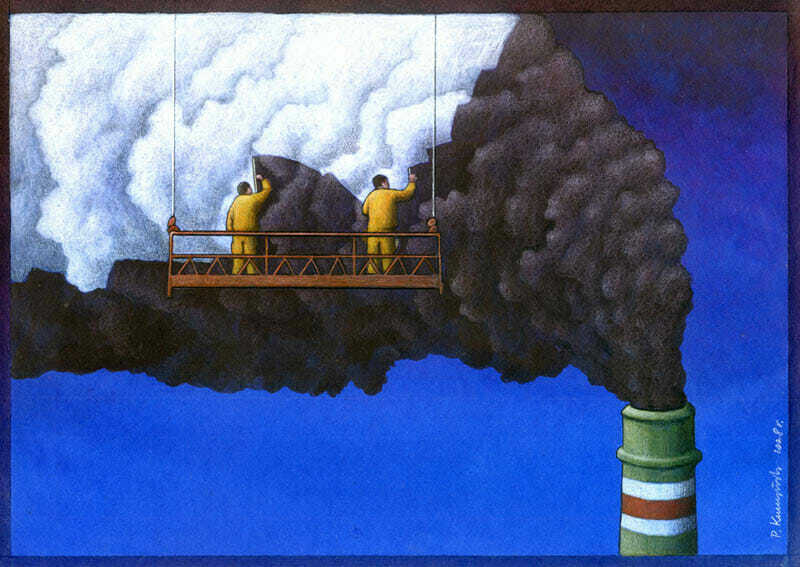 This image was used by Battelle labs (update: still is) to illustrate their air pollution expertise. The sad-faced girl with the inhaler is classic, but what makes this my favorite is the water vapor plume from the nuclear plant (you can see the nuclear reactor dome). The water vapor from a nuclear plant cooling tower has only pure water -- it has no combustion products and no particulates that might give this poor girl asthma. It does not even have any CO2 in it, if that is your particular bogeyman. But water vapor is a stronger greenhouse gas than CO2! I fully recognize that the plume from a cooling tower is steam, as in the bottom picture, but how are we tell that the first image is actually just steam? My understanding is that anything coming out of the smokestacks of, say, a power plant are the (likely) scrubbed combustion products. Those combustion products might be mostly steam, I think it is a bit misleading to say it is only steam. Personally I blame the opening of the Simpsons for peoples misunderstanding of the most iconic feature of nuclear power plants. If you really want to hit the ceiling, check out what the EPA's official measurement device for smokestack emissions opacity is. You guessed it, the Mark I Callibrated eyeball. And even better, the allowable "callibration" error is 15%. So if your allowable standard is 30%, you're at 25%, but the inspector decides it's 35%, you're in violation. "I think it is a bit misleading to say it is only steam." It might be if that's what he said. But he didn't. Water mostly doesn't count as a GHG because it's the same water being recycled. Then again if water that was not previously part of the hydrolic cycle is introduced then, yes, it would mostly definitely contributing to global warming. Ok. I read the previous post more closely. Makes more sense now. Coal-fired power plants are required to remove particulates (mostly soot) and sulfur oxides from their exhaust gases. These technologies are highly efficient, and the exhausted combustion gases consist of excess air (oxygen and nitrogen) water vapor and carbon dioxide. I am old enough to remember the dirty exhausts of the 50s and 60s, when Boston's air had a distinct yellowish tinge and a sulfurous odor. There was also a significant amount of carbon soot that discolored everything. The Northeast urban tradition of switching to black clothing in the late fall and for the winter reflects the old air pollution problem that occurred when the coal-fired furnaces that heated homes and offices were fired up. That doesn't occur anywhere in the USA today. I think they teach this in Science Journalism 101. Every single article in newspapers dealing with pollution/global warming has a picture of steam, it seems. I wonder what will happen when somebody invents an efficient hydrogen burning car? Only thing coming out of the tail pipe will be water vapor. People already like to joke that electric cars are really coal-powered cars. Likewise there's no known easy-to-get source of hydrogen hence it is energy-wasteful. Hell, "Mythbusters" showed you can run already an ordinary car on hydrogen. the authors lay out how the EPA's faulty science can be challenged using the federal rules of procedure. But what does it say about Battelle's expertise in air pollution when they can't recognize a water cooling tower when they see one? Look closely at the second picture: the guy on the left is using a squeegee, like window cleaners use. Look to the right of his squeegee, and there's an arc that's characteristic of an area that's already been swept (you'll know what I mean if you've ever watched a window washer.) There's no way the picture can be depicting anything but the workers painting over the steam to make it look like smoke. What that means in the context in which the picture was drawn, I don't know. As a chemical engineer, I want to loose my lunch every time I see a cooling tower on TV represented as a source of air pollution. What does this say about the competence of our journalists? Until last month, I worked for Battelle Labs. I never came across that picture, but it's pretty funny. Battelle isn't honest about a good many things, although "integrity" is allegedly a core value. Hey, politicians turn equine excreta into gold all the time, or at least that's what they claim. Perhaps the downside of that is water vapor gets turned into pollution...? Maybe even magic has to follow the Second Law of Thermodynamics...? Cooling towers can and do generate particulates depending on the total dissolved solids in the cooling water. These are seldom of any consequence for public health but they can and do results in "hard water spotting" on cars immediately downwind. Many power plants offer a free car wash/rinse facility for their employees. Salt water cooling towers are worst, as expected. It can be as bad as living at the beach!!!! It's good to know that there is really no air pollution. We can all rest easy now. What's funny about this post? The reality that massive increases in water vapor added to the atmosphere would cause an immense change in the climate on this planet, on account of the fact that water vapor is the strongest greenhouse "gas" (it's not a gas, but a vapor, and because it's a macro-particle, it has more effect on holding heat than methane and CO2). The fact that the majority of "smokestacks" are actually water vapor makes this idea hold more merit. The fact that airlines fly high above the troposphere where water vapor is unfamiliar and clouds rarely maintain also helps this idea. The fact that ice-crystal spreads far throughout the stratosphere after airlines fly through is almost a surefire indication of this idea's merit. The fact that ice-crystals even better at trapping heat than liquid water vapor... I could go on..... But, hell, let's just keep saying that CO2 is the only cause. As an episode in Walking dead says, "The world is driven by fossil fuel". Sadly, this is true, having said, we must not be against the system of production of the towers.